Toucans – colourful birds from South America. The family Ramphastidae where toucans belong to is characterised by a remarkable large bill compared to their body size. In total, there are 34 known species which show the highest diversity at the Amazon Basin. The Tupis, native inhabitants of Brasil, call the Toco Toucan, which is an important representative of the Toucans in Brasil, Tucano-açu which derives from the word "tu-quá" or "tu-cá" standing for "large bill". The word "açu" can be translated as "large", "considerable" or "gigantic". Breeding toucans in captivity is still rare worldwide. 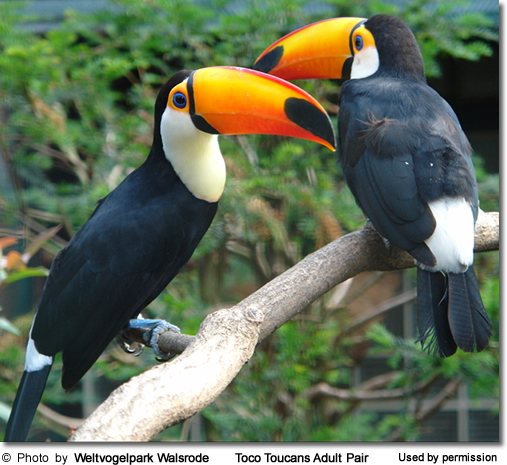 In Weltvogelpark Walsrode working with toucans is an important characteristic since the foundation of the park. The Toco toucan (Ramphastos toco) is the heraldic bird of Weltvogelpark Walsrode, can be found on the old logo of "Vogelpark Walsrode" and is still represented on flyers, posters and entrance tickets. 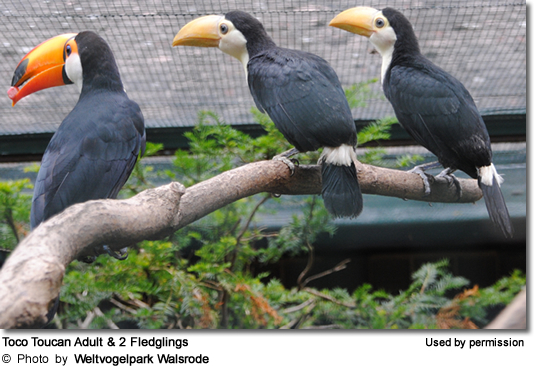 Weltvogelpark Walsrode was the first institution worldwide to breed toucans. In 1967 the park bred the green-billed toucan (Ramphastos dicolorus) for the first time and four young birds were successfully reared by their parents. A detailed description of the breeding success was published in the annual report of the bird park. In January 2010 altogether five species of toucans were brought to the park from Guyana, South America. After successfully completing the quarantine different breeding pairs were set up on and off show. After only one year some of the new breeding pairs showed pronounced interest for the nesting boxes and displayed courtship and mating behaviour. Two out of the five imported Index of Toucan Species now already bred successfully. In July 2011 young Toco toucans (Ramphastos toco) and Black-necked Aracaris (Pteroglossus aracari atricollis) fledged. Weltvogelpark Walsrode is very proud of these events as the breeding of toucans is not easy. The Toco toucan (Ramphastos toco) can be found in the east of South America from Guyana until the north of Argentina and Paraguay. Generally, it lives at the edge of forests near streams and coasts, in habitats with scattered trees and on savannas and plantations. This largest species of toucans is the only one to prefer more open habitats outside of rainforests. They feed mainly on fruits and insects, but also use their large bill to rob the eggs and juveniles of other bird species - although recent studies in the pantanal, a tropical wetland, show this to be exceptional (R. Watson u.a. 2011, pers. comment). In general, they lay two to four eggs per clutch. Breeding is done by both the male and female for 17 to 18 days. In the beginning directly after hatching, the young are fed mainly with insects. While growing they are fed more and more with fruits as well. After 43 to 52 days the young fledge from their nesting cavity. In spring 2010 one pair of young Toco toucans was placed in a large, densely planted enclosure of the pheasantry – on show and thus visible for the visitors. In May of the following year 2011, the pair already showed great interest for the nesting box, which is made out of a natural stem that was placed slightly sloped at the back wall of the outside enclosure. To stimulate the birds further their food was adapted before the breeding season – thus the amount of proteins was increased and the food itself was enriched with more vitamins. Relatively early, the pair of Toco toucans showed territorial behaviour and behaved aggressive against other bird species housed in the same enclosure and which also used the upper parts of the tree branches. Thus, other birds were removed from the enclosure to make the whole enclosure available for only the Toco toucans. At the 6th of June 2011 the bird keepers in the tropical section of Weltvogelpark Walsrode found two egg shells outside of the nesting box. To not disturb the brooding birds, cleaning and maintenance of the enclosure was minimised. At the time where the young hatched, it was unsure how many young were sitting in the nesting box but at the end of June we could hear the first begging sounds inside the box. While the young ones were growing up the parents removed the droppings from the nesting box. The adult birds were provided with fresh food during the whole day to make sure that the young birds are all fed sufficiently. Shortly before fledging at least one young birds could be seen first with its beak, then with the whole body at the entrance of the nesting box. At the 21st of July 2011 the first young left the nesting box. One day later the second one fledged and a third young was seen for the first time at the entrance of the nesting box. The whole staff was very proud and happy about this because nobody really believed before that there could be three young Toco toucans in the box. The last young then fledged at the 25th of July. One could see that the young toucans differed in body size. Nonetheless, they all were able to fly precisely from tree to tree. After fledging they flew directly to the perches in the enclosure and then investigated their surroundings. After leaving the nesting box the young were never seen to enter it again – even by rain they stayed in their outside enclosure. Already at the 30th of July the oldest juvenile was observed to feed by itself at the feeding dish. The young Toco toucans resembled their parents but still had a smaller beak and a duller colour of the feathers and the beak. They were in a very good body and feather condition and from the beginning onwards were very alert and curious. They did not behave fearful towards the keepers or the visitors. 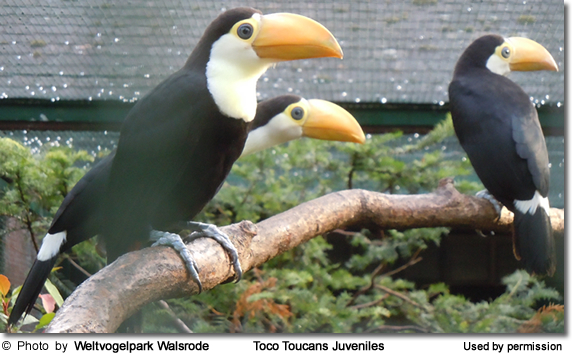 For Weltvogelpark Walsrode it was the first time ever to parent rear Toco Toucans – in general breeding and rearing Toucans by the parents is a very rare event. The main conditions needed to successfully breed toucans are a compatible breeding pair and a nesting box that is suitable and accepted by the pair. We use natural stem boxes that are especially produced for the park. Half of the nesting box then is filled with wood shavings. First, Weltvogelpark Walsrode always tries to let birds parent rear their young. Thus, they can show their natural breeding behaviours which considerable contributes to the welfare of the animals. Furthermore, the young toucans are socialised by their parents, enhancing the probability that these birds later are able to breed and rear their young by themselves. Toucans that are hand reared can be highly imprinted on humans, thus making it more difficult for the birds to learn how to rear their young by themselves. 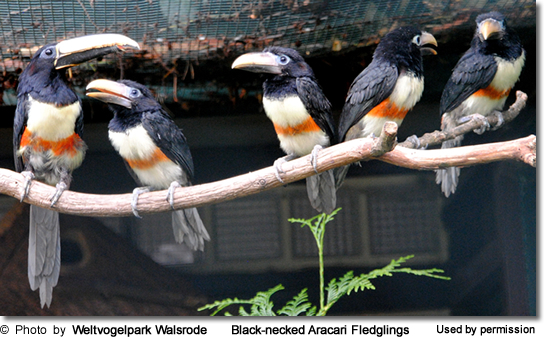 Aracaris, represented in Weltvogelpark Walsrode by the Black-necked aracari (Pteroglossus aracari atricollis) and the Green aracari (Pteroglossus viridis) which already bred successfully in the park, belong to the smaller species of toucans. The Black-necked aracari occurs from the north-east of South America to the south-east of Brazil. It inhabits lowland rainforests as well as gallery forests of savannas and plantations of fructiferous trees like papayas. This species lays two to four eggs per clutch. Both adults incubate the eggs for 16 to 17 days. The young hatch naked and are greyish coloured. They are fed by both parents – partly by regurgitated food. After approximately 40 days the young fledge. Nearly at the same time as the Toco toucans one pair of Black-necked aracaris, which are housed on show, began breeding as well. The food was adapted, as was done by the Toco toucans, to have a higher amount of proteins and vitamins at the start of the breeding season. The aracaris behaved territorial as well so that other birds housed in the same enclosure were placed into other aviaries. Since the mid of June the adult birds were observed to be mainly in the nesting box and at the 20th of June they were just seen in the enclosure to feed before they directly returned to the box. By and by one could hear increasing begging sounds in the nesting box, but nobody could say how many juveniles are in the nesting cavity. At the end of the breeding period a small beak could be seen at the entrance of the nesting box and at the 21st of July the first juvenile was leaning out of it. At the 31st July three juveniles fledged and left the nesting box, one day later a fourth juvenile fledged as well. A great success for the whole staff. In contrast to the Toco toucans, the four young birds left the nesting box nearly at the same time and during the first weeks after fledging they returned to the nesting box by night. 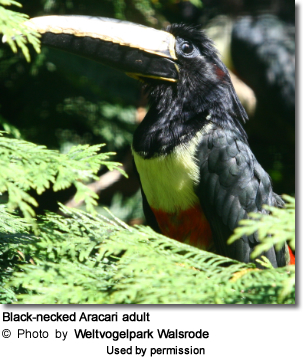 Another difference compared to the young Toco toucans is a higher activity of the young Aracaris, which is based in the lively character of Aracaris itself. Even the adult birds are considerably more active and agile compared to the much larger Toco toucans. 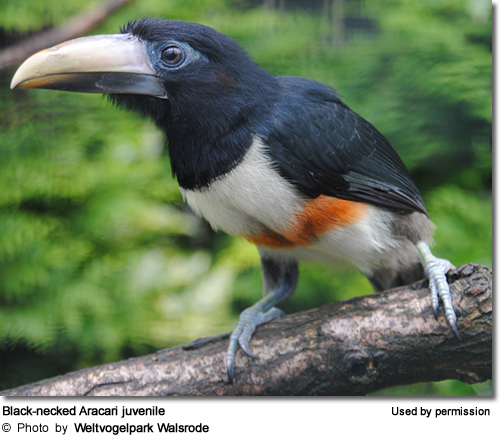 The flight abilities of the young Aracaris was similar to that of the young Toco toucans – they flew directly from perch to perch in the enclosure. The adult birds were observed to be very caring towards the young and they never left them out of sight. The young were fed by both parents which tirelessly collected food items in the inside enclosure and brought them to the young. Apart from being smaller in body size and having a smaller, duller beak the young resembled the adult birds.